Fiberbuilt molded rubber foundation adds aesthetic value and an extra layer of flexible rubber compound for increased comfort and playability. Your mat will never shift, blow away, or curl. If you have any questions regarding the Fiberbuilt 5'x5' Golf Hitting Mat, please give us a call, we would be happy to help you with any questions you may have. 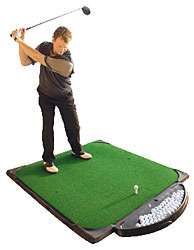 Write an online review on the Fiberbuilt 5'x5' Golf Hitting Mat, and share your thoughts with others.